I don’t like reading mushy romance. But Ravinder Singh’s book ‘I too had a love story’ got me crying. The book is a spell-binding, honest tale of Ravin’s love story with Khushi – the girl he loved but couldn’t marry. Ravinder Singh’s narrative resonates with honesty, passion and an innocence that is rare among today’s Indian writers. He tells you of how passionately a man can love and respect the woman he loves and how desperately he can fight for her life in the midst of life threatening crises. Most Indian love stories end predictably. Ravinder Singh’s story is not like that – I had tears flowing down my cheeks when I read Khushi’s last words to him in a moving bus. I could personally relate to that surreal experience of saying good bye forever. It has happened with me but in a different context. And then, what broke my poise was the last chapter. 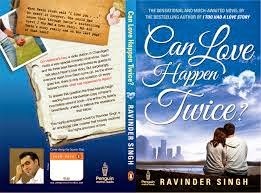 Whether you believe in love or not, Ravinder Singh’s book ‘I too had a love story’ is a MUST READ. The story of Ravin and Khushi reveals the touching and authentic side of what happens to a man’s life when he loves a woman truly, madly and deeply. Keep inspiring, Ravinder Singh. Your honesty rocks! Thanks so much Brother @Aravind - you made my day! hey Swapna - I will be picking up this book because of your wonderful review! SOunds like a touching and poignant book. And from your brief description, looks like one that might touch a lot of different nerves for me:) lol Thanks for the write up. Hey Vishnu, Glad to hear that you plan to read it. Do tell me how you find it.